Sweet soups are often served after a meal as a dessert or eaten as a teatime snack. There is a whole range of sweet soups, many of them using medicinal ingredients which are beneficial for health, such as ginseng and aloe vera. These dessert soups are also considered to be “cooling”, which makes them perfect for the heatwave we’re currently experiencing. 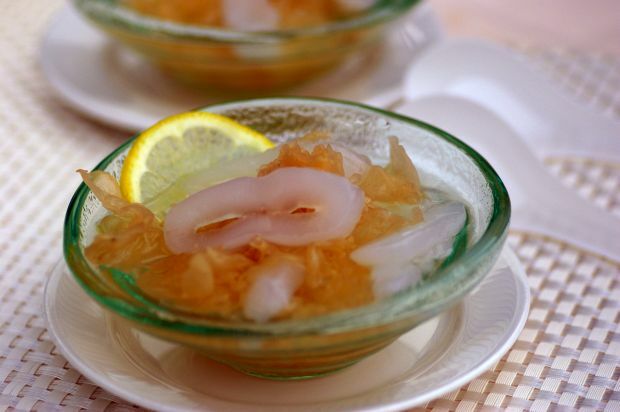 Soak white fungus in warm water until soft. Drain and tear into bite-sized pieces. Peel sea-coconut and cut into slices. In a large saucepan bring water and rock sugar to a slow boil. When sugar has dissolved, put in sea-coconut. Boil over low heat for 20 minutes. Add white fungus and simmer for 15 minutes. Turn off the heat and add lemon slices. Serve hot or cold.